* Mestre em Odontologia, Centro de Pós-Graduação / CPO São Leopoldo Mandic, Campinas, Brasil. ** Instituto da Cabeça, Universidade Federal de São Paulo, Brazil. *** Professor & Head, Department of Anatomy, Universidad de Talca, Chile. SUMMARY: The lateral pterygoid muscle (LPM) is important in the physiology and dysfunction of the temporomandibular joint (TMJ), which has described the presence of a third head in the lateral pterygoid muscle (THLPM). The purpose of this study was to evaluate the prevalence of THLPM and its relationship with the TMJ disc through magnetic resonance imaging (MRI). It was evaluated 178 MRI of the TMJ of healthy individuals, in images that presented THLPM, and these were defined and measured at the surface inserted into the disc. The prevalence of THLPM was 20.22% (n = 36). Insertion of THLPM was made entirely on the TMJ disc, the average area of insertion was 4.14mm (SD 1.35) in women and 4.67 (SD 2.68) in men, but these differences were not significant. We concluded that the LPM has a complex structure, and that a THLPM could contribute in the development of TMJ disc function alterations and anterior disc displacement. KEY WORDS: Lateral pterygoid muscle; Temporomandibular joint; Articular disc; Temporomandibular dysfunction. RESUMEN: El músculo pterigoideo lateral (MPL) tiene importancia en la fisiología y en la disfunción de la articulación temporomandibular (ATM), se ha descrito la presencia de una tercera cabeza en el músculo pterigoideo lateral (TCPL). El propósito de este estudio fue evaluar mediante resonancia nuclear magnética (RNM) la prevalencia de la TCPL y su relación con el disco de la ATM. Se evaluaron 178 RNM de ATM de individuos sanos. En las imágenes que presentaron TCPL éstos fueron delimitados y se midió la superficie inserta en el disco. La prevalencia de la TCPL fue del 20,22% (n=36). La inserción de la TCPL se realizó completamente en el disco de la ATM, la media del área de inserción fue de 4,14mm (DS. 1,35) en mujeres y 4,67 (DS. 2,68) en hombres, estas diferencias no resultaron significativas. Concluimos que el MPL presenta una estructura compleja y que una TCPL podría participar en el desarrollo de alteraciones en la función discal y en la presencia de desplazamiento anterior del disco. PALABRAS CLAVE: Músculo pterigoideo lateral; Articulación temporomandibular; Disco articular; Disfunción temporomandibular. The lateral pterygoid muscle (LPM) is a craneomandibular muscle derived from the first pharyngeal arch, and plays an important role in the mandibular movements and the dynamics of the temporomandibular joint. It is a short muscle, flattened shape of prismatic located in the infratemporal region. Its formation is classically described as a biceps muscle, in which its fibers originate from two muscle fascicles and are directed from the sphenoid to the neck of the mandibular head. Superior fascicle or sphenoid: its fibers begin in the horizontal portion of the greater wing of sphenoid bone and extend up to the infratemporal crest and in the superior fourth in lateral side of the lateral wing of the pterygoid process. From this origin, the superior fascicle fiber projects obliquely to the inferolateral and posterior portions and inserts into the pterygoid fossa of the neck of the mandibular head (most of the fibers) and the anteromedial portion of the capsule and the temporomandibular joint disc. (Naohara, 1989; Bittar et al., 1994; Naidoo & Juniper, 1997; Zhang et al., 1998;Filho & Alves, 2006 and Alves, 2008). Inferior fascicule pterygoid: It originates through direct fiber from inferior three quarters of the lateral side of the lateral wing of the pterygoid process, including a small portion of the pyramidal process of the palatine bone and may project some fibers to the maxillary tuberosity. From its origins, the muscle fibers of the inferior fascicles are oriented superolaterally and posterior fascicles are inserted into the pterygoid fossa of the neck of the condyle. This classic description has been discussed recently. Usui et al. (2008) have previously indicated that the margins between the two heads were difficult to distinguish. Desmons et al. (2007) had reported that the complex structure of the LPM resembles that of peniform muscles. On the other hand, Fujita et al. (2001), in an anatomic study, reported the presence of a third head at a superior location of the THLPM, identifiable due to a fascial sheath in 7 of the 20 bodies analyzed. Given the importance that LPM has in the physiology of the temporomandibular joint (TMJ) and its implication in the joint dysfunction, the purpose of this study was to evaluate using magnetic resonance image the presence of the third head of the lateral pterygoid muscle (THLPM) and their relationship with the TMJ disc. 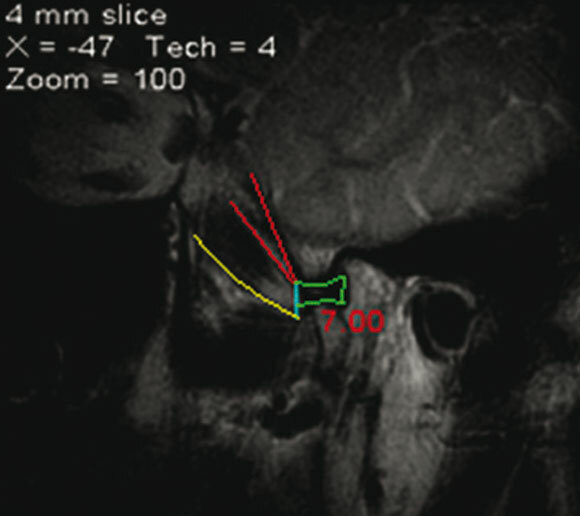 It was analysed 178 TMJs (103 adults, 20­45 years) using magnetic resonance image (MRI) T1, obtained in corrected sagittal plane, from Computerized Tomography Center of the Samaritano Hospital Sao Paulo - Brazil. This study was conducted with the informed consent of patients at the time of taking the images and the approval of the Ethics Committee of the Hospital. The examinations were requested by different clinical service for various reasons, but those with a history of mandibular lock whether in opening or closing, disc adherence, trauma, or study in pre- and/or postoperative evaluation of the TMJ surgery were excluded. The images were analyzed using the program MEVIS 2.9, then the anatomical components of the articulations were identified, delimiting the heads of the lateral pterygoid muscle and the disc, and wherever a third head was found, it was defined and measured at the insertion disc surface (Fig. 1) The significance of the differences was analyzed by t-test for independent samples with p <0.05. its insertion area into the disc in blue. The joint disc narrows in green. Of the total number of images examined, 36 exhibite a third head in the lateral pterygoid muscle, which corresponded to 20.22% of the total sample. Details of the distribution of presence of the third head of the LPM are found in Table I. The THLPM insertion was made entirely on the TMJ disc surface. 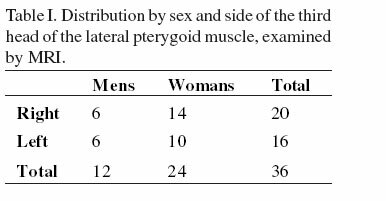 The average insertion area was 4.14mm (SD 1.35) and 4.67 (SD 2.68) in women and men, respectively, and the differences were not significant. The presence of the THLPM is inadequately described in the literature. In this study, we found a prevalence of 20.22% of the presence of this variation on a sample of TMJ in asymptomatic individuals. In all the cases the insertion was made in the TMJ disc; this is significant because the orientation of the fibers suggests an important activity in the stabilization of the disc in relation to the articular tubercle of the temporal bone. Moreover, the arrangement of the fibers, in the form of a fan and the difficulty in determining the boundaries between the heads seem to consider arguments in favor of the LPM as being a multipeniform muscle. This description could be based on the physiological observations, which indicate that the motor units of the LPM are activated at different phases of the joints movement, independent of the portion of the muscle to which they belong (Bhutada et al., 2008). The THLPM's role in the anterior movement of the disc should also be evaluated. Tanaka et al. (2007) indicated that the increased activity of LPM is involved in the disc overtaking, so a THLPM fully inserted into the disc could be involved in the etiology of this alteration. The THLPM is considered an anatomical variation despite the prevalence found in this study, which suggests that their presence may have a clinical significance. We concluded that the LPM has a complex structure, and that a THLPM could participate in the development of alterations in disc function and in the presence of anterior disc displacement.